The laminate for 1994’s Flatlander Festival. I hold onto festival laminates. I don’t know why, especially since I don’t have many (Other than Maha and SXSW years ago, I avoid festivals). I found this one while digging through stuff recently, and it has a connection to The Reader‘s 25th anniversary, which is being celebrated this month in print. If I remember correctly, John Heaston and The Reader (or what would become The Reader) was responsible for this festival, which was held at Sharky’s on around 77th and Cass St., a club that became the new Music Box and which has long been razed and replaced with a 24-Hour Fitness (or whatever they’re calling that monstrosity). 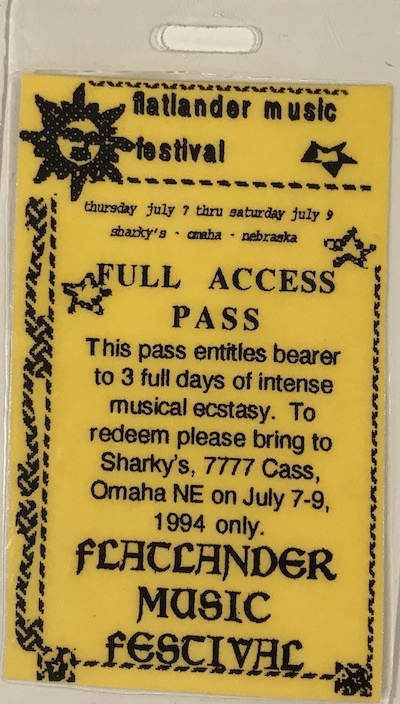 Sharky’s had a railroad business car attached to the west side of the building, and I believe that The Reader had its offices in that rail car for a brief period around when this festival took place. I can’t remember who played the fest, though I think Cactus Nerve Thang was on the bill. Was anyone else there? Tonight is the big Better Oblivion Community Center a.k.a. Conor Oberst/Phoebe Bridgers show at The Slowdown. This show sold out very quickly, within a few days. It was discovered that scalpers bought a large block of tickets, which showed up on sites like stubhub.com. As days passed, those tickets dropped in price. I’ve heard they were as low as $8 at one point — quite a discount compared to the $25 face value. No doubt ticket scalping has become a problem in some parts of the country where shows sell out and then tickets become available overnight in the after-market for twice or more the face value. That wasn’t the case here, and one wonders if the scalpers got soaked this time. This morning I saw a ticket for under $20 for tonight’s show. There is no moral to this story. One could argue that in this case, everyone won — the venue sold out a show immediately and fans who understood the after-market situation could buy tickets for well under face value. Which begs the question: Are you better off buying tickets the day they become available or waiting a few days to see how prices shake out? For example, folks who bought tickets to last year’s Jack White show at The Baxter on the first day paid way more than they needed to, as tickets became available for a fraction of face value due to poor demand. On the other hand, had the show sold out and if there was serious demand, those who waited would have had to pay a premium for seats. If you’re going to the show tonight, get there early. Opening act Christian Lee Hutson is someone worth catching. He plays in BOCC and has written with Phoebe Bridgers in the past. His latest song, “Northsiders,” has a definite Elliott Smith vibe that leaves you wanting more. The other opener, Lala Lala, is pretty awesome as well. Doors are 7 p.m., the show starts at 8 p.m. If you want to catch Hutson, get there early because no doubt there will be a line to get in. I can’t tell you how many times I’ve heard the opening band from the sidewalk outside of Slowdown because of the lines (which are slow due to the whole under-age look-up scenario). Read Tim McMahan’s blog daily at Lazy-i.com — an online music magazine that includes feature interviews, reviews and news. The focus is on the national indie music scene with a special emphasis on the best original bands in the Omaha area. Copyright © 2018 Tim McMahan. All rights reserved. Better Oblivion Community Center is Phoebe Bridgers and Conor Oberst, plus a host of indie rock veterans. In addition to rolling out Better Oblivion Community Center — the new band fronted by Conor Obert and Phoebe Bridgers — on The Late Show with Stephen Colbert last night, the band also dropped the entire debut album, released on Dead Oceans. Hey, who needs to wait ’til Friday to release an album? Out front in the TV performance, which is embedded below, was a grizzled Oberst in Converse sneakers and the angelic Bridgers, who provided the prominent voice on song “Dylan Thomas.” Is Bridgers “Ally” to Oberst’s “Jack Maine”? We all know how that one ended. No, not quite; and the band also isn’t a return to the Laurel Canyon sound, as Rolling Stone seemed to imply in its 4-star review of the record. Instead, Oberst and Bridgers are building on top the current singer/songwriter movement associated with the artists like those in boygenius (Bridgers, Julien Baker, Lucy Dacus), Mitski, Big Thief, Soccer Mommy, and so on. Or maybe I’m just listening for Bridgers more than Oberst on these songs. Certainly you can’t miss Conor, who’s growly croon is an abrasive counter to Bridgers’ sweet coo. It’s easy to pick out who wrote what if you’ve been following along the last couple of years. The pretty, sad stuff is Bridgers; the folky slice of life stuff is Oberst. The sound isn’t so much a true duet as much as one guesting on the other’s songs. The only other person I recognized in the video last night was Nick Zinner of the Yeah Yeah Yeahs, who’s as genius as ever on guitar. Other BOCC participants according to the Q&A at the Secretly Store website are Carla Azar from Autolux; Wylie Gelber and Griffin Goldsmith of Dawes; songwriter Christian Lee Hutson on guitar and Anna Butterss on bass. The album was produced by Oberst and Bridgers with help from Andy LeMaster, who you might remember from Now It’s Overhead. Quite a splashy way to launch a project. I wonder when they’re going to drop the cheesy phone number/fake self-help program facade, which, because it wasn’t explained, came off clumsy last night on the Colbert show. My wife asked, “What’s with the graphics and the phone number on the screen?” It takes a long time to explain the joke. Hopefully they’ll leave it off when they play this weekend on CBS This Morning Saturday. BOCC tour stops apparently will be announced next week sometime. Here’s hoping for an Omaha date. Noname (a.k.a. Fatimah Warner) is a Chicago indie hip-hop artist. Her self-released debut Room 25 chronicles the two years since the release of her debut mixtape Telefone, “most notably her move from Chicago to Los Angeles and an intense, short-lived relationship that resulted in the loss of her virginity at age 25,” says the Wiki. She headlines tonight at The Waiting Room. Opener Elton kicks things off at 8 p.m $25.